Looking for the best waterproof boots? Good news, we know the top 10 and we’re willing to share what we know. 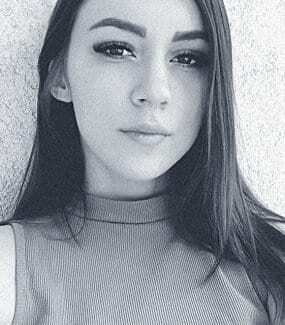 Check them out inside. 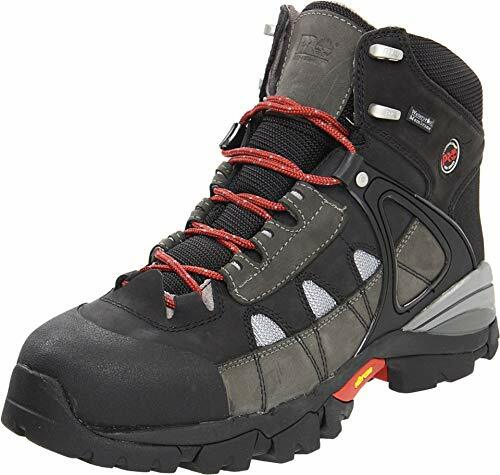 Waterproof membrane, steel shanks, and EVA midsoles allow these boots to keep feet dry, arches supported, and the one wearing them comfortable. While neoprene rubber keeps the water from getting in, stretchable bootie adjusts to the shape of your feet. These boots provide plenty of protection and can last a long time. 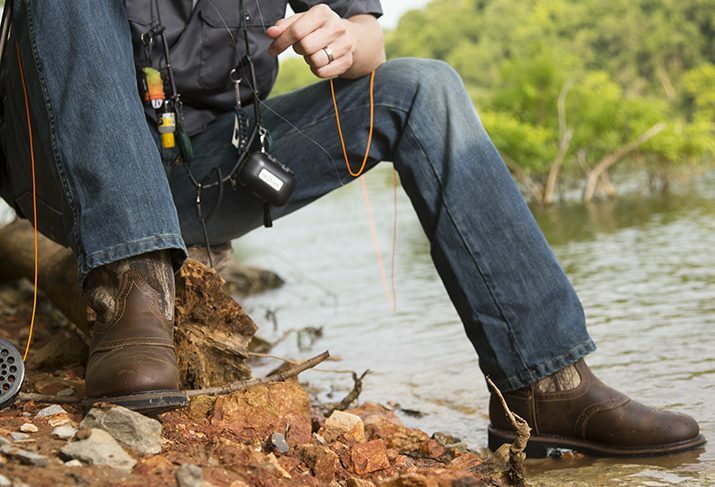 These work boots boast a high level of sturdiness, but they’re also great at protecting you from water. Thanks to improved heat retention, they keep feet warm at all times. Since they keep feet dry, provide protection, and reduce fatigue, these rubber boots are an excellent choice for a working man. But that’s not all – they’re also great at fighting off odors. 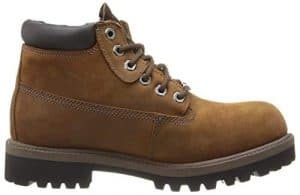 Apart from being completely waterproof, these work boots also manage to strike a balance between being sturdy and not being too heavy for all-day wear. 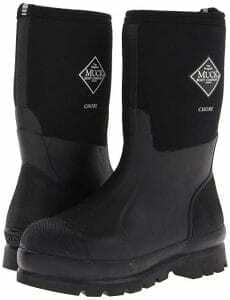 Thanks to quality materials and a waterproof membrane, these boots are resistant to water, oil and chemicals. And they’re both sturdy and comfortable at that. 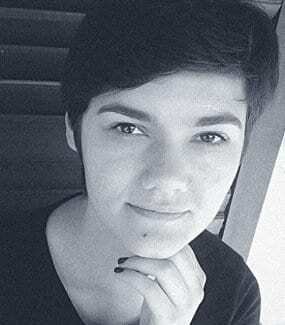 Ruzica is a passionate copywriter on a mission to stamp out fluff and provide readers with quality content. 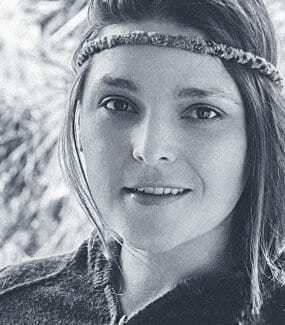 When she's not working, you can find her travelling, writing fiction, and hanging out in coffee shops. 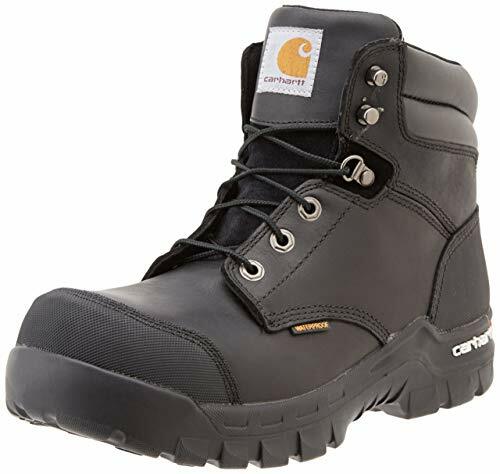 When you have to be on your feet all day, work in poor weather conditions, or even face occupational hazards, finding the right footwear becomes crucial for both your safety and comfort. But how do you find the best waterproof work boots when you can hardly find a pair of regular shoes that will serve you well? You won’t actually have to do the work, since we’ve done all the research for you. 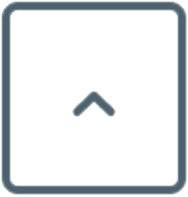 Here you’ll find not only detailed reviews of the very best the market has to offer, but you’ll also be able to refer to our buyer’s guide whenever you need something cleared up. It’ll be the easiest shopping for shoes you’ve ever experienced. Our search for the very best models needed to yield boots that are at the same time waterproof and suitable for working conditions. That’s why we ended up going through a lot of reviews from working men talking about their favorite footwear. Of course, we also tried them all out ourselves to see if they could really keep our feet from getting wet. 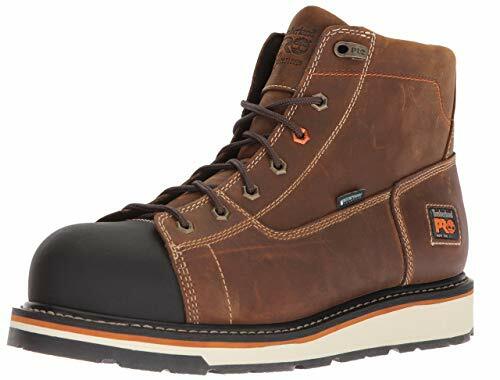 The end result is a list of 10 ultimate work boots, which we ranked according to how well they faired when compared to others, giving you a comprehensive guide through the best available products. What makes a pair of boots fit for working in poor weather conditions? First of all, you need to make sure they’re completely waterproof, that is, made from high-quality materials and maybe even complete with a water-resistant membrane. Then you need to take insulation and traction into account, making sure your new shoes are both warm and equipped with non-slip outsoles. If there’s any danger of injuring your feet, get a pair with toe and heel reinforcements, but whatever you do, try to pick among the more durable. Since there are so many available options, choosing the right pair of work boots has the potential of turning into a really tiresome process. Of course, there are also ways to make it easier for yourself. 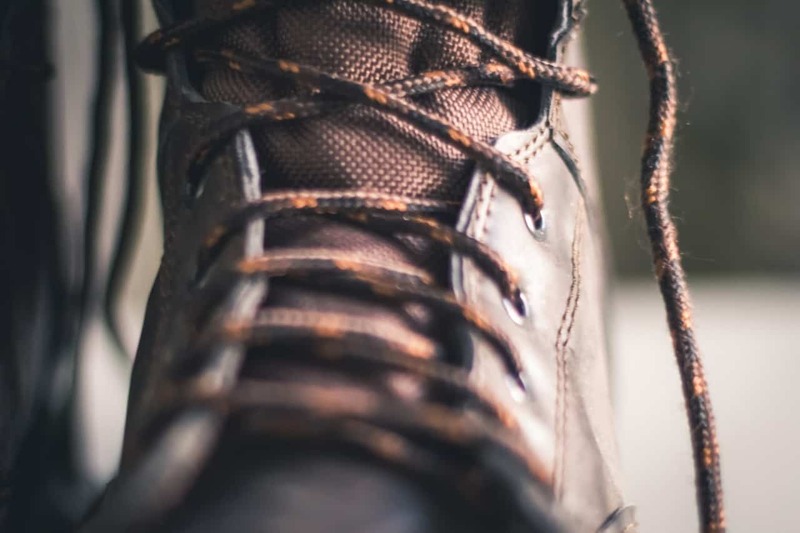 For instance, you can go through the following paragraphs to see what’s really important when it comes to both waterproof footwear in general and work boots in particular. According to HiConsumption, waterproof and water-resistant are often used interchangeably, although they don’t actually mean the same thing. How water-resistant an item will be depends on how dense its materials are. So linen shirts, for example, will be much less water-resistant than polyester ones, simply because they aren’t woven as tightly. When talking about waterproof items, we sometimes refer to those made of water-repellent materials. Now, repelling water isn’t the natural quality of any material, but a feature given to it with the help of a special treatment or coating. This can be done as part of the production process, but you can also buy special products and do it from home. The best waterproof items out there are often referred to as hydrophobic. What difference does all this make to you? Water-resistant items often provide poorer protection from water than water-repellent, mostly because, with the latter, the water simply slides off instead of staying on the surface. However, water-repellent items lose their ability to repel water as the coating or the material itself wears down. No one can tell which is better for you, but keep in mind that buying water-resistant work boots and then treating them yourself is also an option. One of the most important qualities of a work boot is its ability to protect your feet from both compression and falling objects. 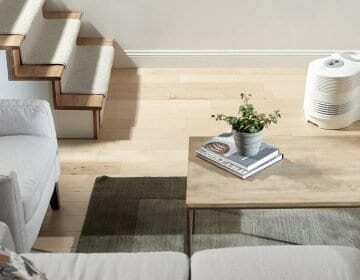 To do that, it needs to be made of quality materials and provide a snug fit. That’s why you should never compromise on material quality and also why you should always check sizing charts before making any final decisions. When it comes to protection, there are two special features that can make a world of difference: toe and heel reinforcements. At least that’s what we saw the most of while we researched the topic. Let’s see what they are and what they can do for your feet. Both toe and heel reinforcements are usually made of steel. These are metal parts placed in the toe and heel areas of the shoe to add protection. 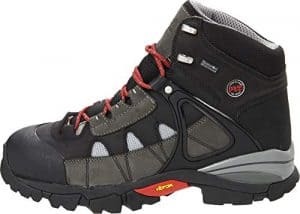 Since they’re as tough as can be, they make it nearly impossible for anything to hurt your foot, whether by falling on it or by damaging the boot in any way. So if you want to feel protected from any risk your job might impose on you, make sure your next pair of work boots has these kinds of reinforcements. If you’re in construction or any similar line of work, you know how important it is to keep your balance at all times. It’s not just about avoiding accidents, though. Wearing footwear that doesn’t provide stability can have negative impacts on your posture. This, in turn, affects your overall health and your ability to do your job properly. What can you do to make sure your work boots provide you with enough stability? According to our research, two features are designed with this specific purpose in mind: shanks and shock diffusion plates. Shanks are often made from steel, but composite materials are used as well. They’re located between the insole and outsole of each shoe, providing stability by adding arch support. Shock diffusion plates refer to the exact same part of the shoe, but they don’t just make it more stable. They’re made to reduce the shock of each step you make, putting less strain on your feet than shanks. There are a lot of factors to consider when talking about comfort, but it mostly comes down to design and materials. To make it even easier for you to choose the best work boots for yourself, we’re going to highlight some of the most important characteristics of comfy footwear. Most work boots are made from either rubber or leather. They can both be comfortable enough, although this depends on their flexibility. To make sure you’ve made the right decision, check our detailed reviews for information on how each pair feels when worn. Apart from the main materials, you also need to consider what’s used to make the insoles of the shoes of your choice. If you want them to be truly comfortable, you’ll need to look for a balanced combination of support and cushioning. Polyurethane insoles, such as those made from EVA foam, are among the best available options that are currently available. At the same time, they support your arches and make your foot feel comfortable. We all know materials have a huge impact on how durable an item will be. And we’ve mentioned that a large number of work boots are made from either rubber or leather, which can both be materials of the highest quality. 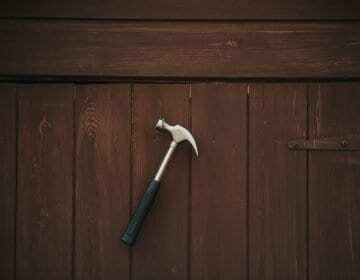 However, there’s still one important factor left to mention – type of construction. Work boots, as all other footwear, can be made in several very different ways, that is, by using different types of construction. While researching and testing our top ten models, we’ve found that they’re mostly of cement, stitch, dual-forged or direct inject construction. According to Total Shoe Concept, when a shoe is cemented, it means its parts are connected using an adhesive. Stitched shoes have parts that are connected using stitching. While the former is the cheapest way to construct a shoe, the latter provides improved flexibility. Your third option are dual-forged shoes, which usually combine cementing and stitching to provide both durability and flexibility. There is the direct inject construction. The term refers to the process of injecting a material directly onto a mold. This is a more expensive method for making footwear, but it provides both durability and flexibility, just like the dual-forger construction. If you’re in search of waterproof work boots, chances are you work outdoors and have to deal with rain at least some of the time. This also means you’d benefit from owning footwear that provides a sufficient level of traction. To make this happen, you only need to ensure your work boots come with non-slip outsoles. This is a pretty common feature that’s of significant help in preventing work-related accidents. Your work boots should be breathable as well. After all, you don’t want your feet soaking in sweat all day long. And although plenty of brands have designed their own patented technologies for keeping their materials breathable, a simple mesh lining often does the trick. Keep that in mind while browsing through our detailed reviews in search of your perfect pair of boots. If you want your work boots to suit all your needs and preferences, remember that little things often go a long way. That’s why it’s always a good idea to check out special features and think about how they could help make your life easier. Here’s a list of some of the most common special features found in work boots. Kick rim is a part not all work boots have, but when they do, it’s on the back part of the outsole. Its purpose is to let you kick your shoes off without using hands. Of course, you can do this with all other footwear, but a kick rim protects the shoes from getting damaged in the process. Inner bootie is a stretchy sock you’ll find inside some models of work boots. The upsides to having one are a better fit and improved comfort. As explained in the Occupational Health & Safety guidelines, EH rating refers to shoes that don’t pose any electrical hazards to their wearers. In case of any mishap, they’re designed to keep your body from completing an electrical circuit, which is of great help in preventing work-related injuries. Of course, if none of the above takes care of your needs, you can always look for a specialized gadget. Let’s say that from time to time you find yourself in a situation where you need to work in low-light conditions. Why not solve this problem in the easiest way possible – instead of carrying flashlights, simply use these LED lights for shoes to light the way. With over 40 years of experience in creating quality shoes, Timberland is a brand that boasts wide recognition. 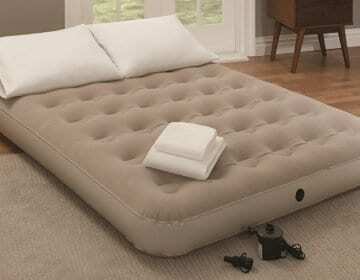 Their products are at the same time comfortable and made to withstand a lot of damage. 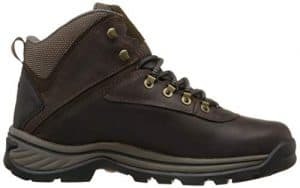 When it comes to work boots, this waterproof model is among the best, although it’s advertised as hiking gear. Our research has shown that these White Ledge Boots are better for working men than they are for hikers. Although they don’t fair that well when it comes to really bad weather conditions, they’re quite tough and completely waterproof. 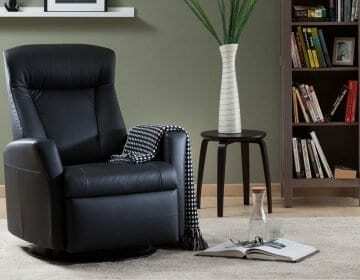 This is mostly due to full grain leather with an oiled leather finish. Also, their rubber outsoles feature Timberland’s B.S.F.P.™ system – multidirectional lugs that make sure you always have enough traction. 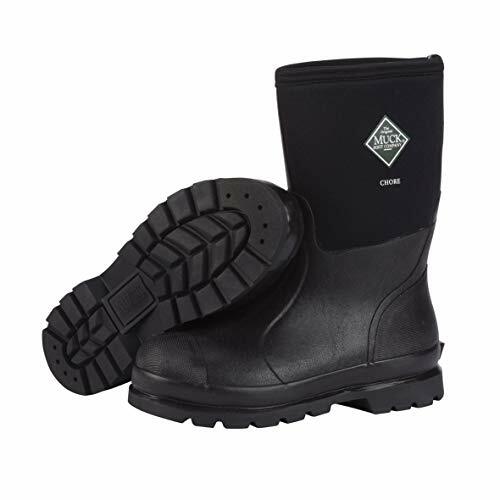 EVA footbeds and padded collars make wearing these boots as comfy as possible. We’ve found that the footbeds do a pretty good job at keeping your feet from sweating as well. Since they’re removable, you can easily wash them whenever the need for it arises. And using the handy pull loop you’ll find on the back of the shoe, you’ll be able to put it on and kick it off with ease. We also need to tell you about the downsides of this model. Our research has showed that there are some issues with the sizing chart, since customers who order a wider boot often complain that it’s too narrow. 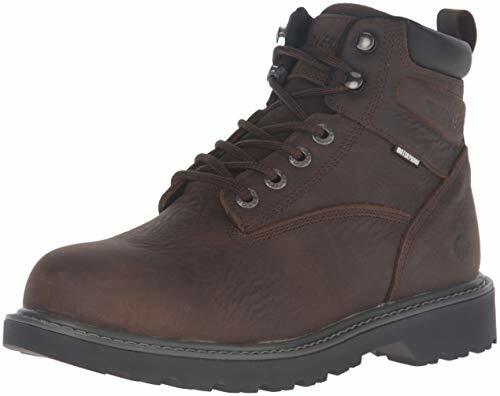 Also, these boots don’t have any steel reinforcements and aren’t as warm as some other models, making them less suitable for working men and winter conditions. 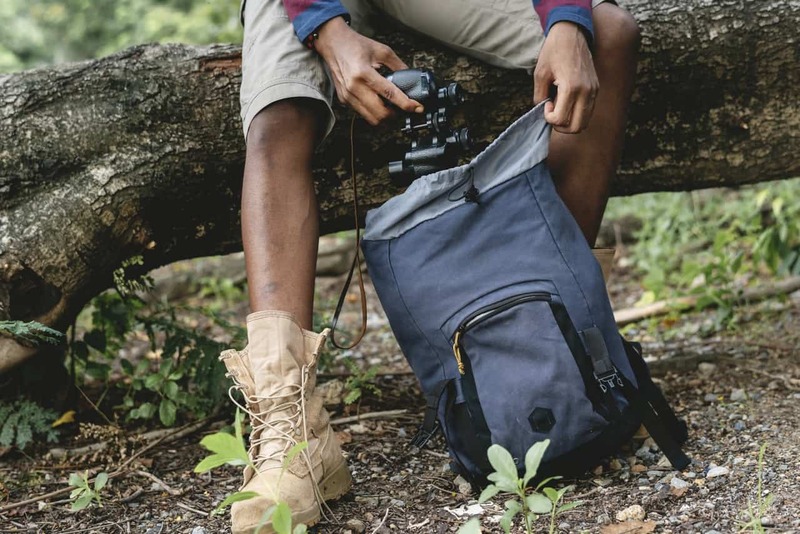 Although it’s not as widely recognized as some of the other brands on this list, KEEN deserves to be included in it. The company’s goal is to provide their customers with comfortable, yet very resilient footwear, which they’ve managed to do time and again, especially with these Mt Vernon Boots. High-quality nubuck leather and KEEN.Dry technology make these shoes completely waterproof. The KEEN.Dry membrane allows them to let vapor escape and prevent water from getting in, keeping your feet dry no matter the conditions in which you work. 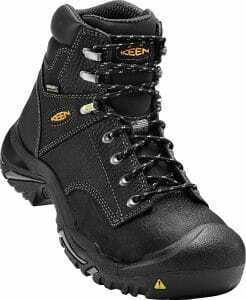 But the brand has another patented technology for improving your safety – KEEN.Grip or the method for making completely slip-resistant outsoles. In addition to that, these shoes come equipped with asymmetrical safety toes that provide you with plenty of protection without constricting movement. These shoes are among the best when it comes to support and comfort, which can all be thanked to their PU midsoles, TPU shanks, and EVA footbeds. While they’re all made from high-quality materials, the latter are very good at keeping you comfortable no matter how long you need to wear your shoes. Thanks to Cleansport NXT™ technology, you won’t have any trouble keeping odors away. There are some downsides that come with wearing these work boots. Although Cleansport NXT™ technology does a great job at fighting off odors, it’s not that great for breathability. If dry feet are of great importance to you, you might want to keep looking. We’ve also found that these shoes aren’t that great when it comes to durability either. As its name suggests, Wolverine is a footwear brand boasting sturdy products that can withstand a lot of damage. This is all thanks to the company’s many patented technologies for improving toughness and water resistance. Apart from all that, Wolverine work boots feature soles and footbeds that give support to your arches and add to the comfort. Their Steel Toe Work Shoe is among their best products. Made from full grain leather, the uppers of these work boots keep water out, no matter the circumstances in which you wear them. The toe part is reinforced with steel, so you don’t have to worry about injuring your feet while on the job. And thanks to the rubber outsoles that provide improved traction, you’ll avoid slipping on wet surfaces. That’s not everything these Steel Toe Work Shoes can offer. Their interior is lined with mesh material, the purpose of which is to wick moisture away from your feet, keeping your skin dry at all times. The synthetic sole and cushioned footbed give your arches enough support, at the same time making sure you don’t get uncomfortable while wearing your shoes. In addition, you can remove and wash the footbed whenever your boots are in need of cleaning. These shoes aren’t perfect. Customers complain that the sizing chart isn’t helpful enough, since the shoes turn out to be too narrow for some. Also, many report that the rubber outsole, although it provides plenty of traction, wears out too quickly for such sturdy work boots. When it comes to work boots, you’ll hardly find more reliable footwear than the one made by Timberland. This is a brand that’s at the same time widely recognized and capable of boasting high-quality products. Their Hyperion series excels in many different aspects. Quality leather uppers of these shoes are reinforced with a waterproof membrane, making them completely resistant to water. Thanks to Ever-Guard technology, they’re resistant to abrasions as well, making them incredibly durable. Their Vibram outsoles are actually made from vulcanized rubber, the purpose of which is to make them slip-resistant. Reinforced with XL alloy, the toe parts make sure your feet stay safe even when there’s danger of injury. 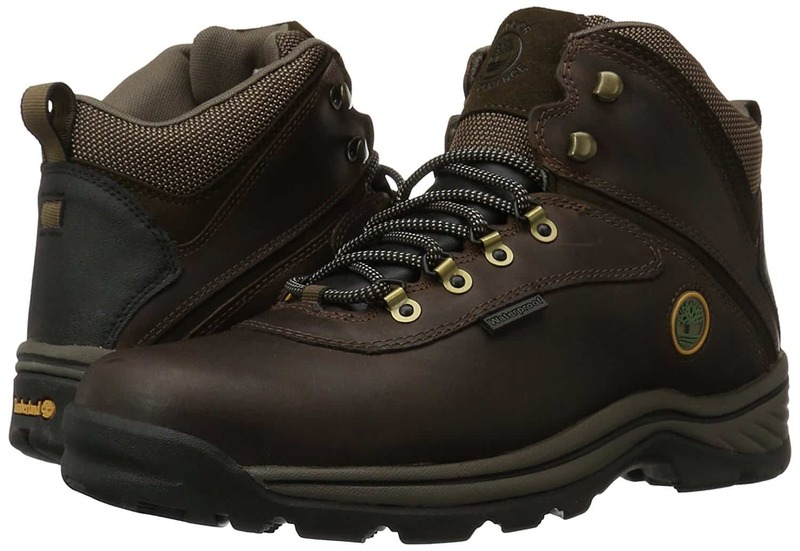 Thanks to molded EVA midsoles and padded collars, these work boots are comfortable as well. Timberland’s Anti-Fatigue Technology improves shock absorption, which makes it easier to stand and walk around in these shoes, even when you have to wear them all day long. The interior is lined with antimicrobial mesh, a material that’s breathable and great at fighting odors. Although they have plenty of great features, these work boots come with downsides as well. Our research has shown that although they provide good traction, the outsoles aren’t as durable as other parts of the shoes. This might not be a big problem for most, but could be a deal-breaker for some. Also, we’ve found them to be a bit too heavy for wearing all day long, at least when it comes to comfort. If you’re looking for quality shoes, you can hardly go wrong with Timberland. 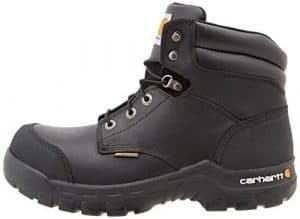 Having been in the business for decades, they have the knowledge and the means to manufacture work boots that will actually be both tough and waterproof. These Industrial Boots are among their finest examples of what this type of footwear should be. 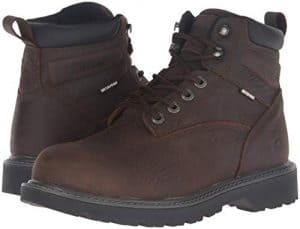 With their quality leather and textile uppers, these boots boast a high level of sturdiness which is so important to those who do physically challenging jobs. Since the leather is full grain and features a water-resistant membrane, you’ll never get your feet wet while wearing them. Their rubber outsoles are made to provide you with traction, so you’re never in danger of slipping no matter the terrain on which you work. When it comes to comfort, these boots have plenty to offer, especially thanks to their EVA midsoles. While they provide both structure and padding, the steel shanks add extra support for your arches. To make them even better, the footbeds in these shoes are made from quality PU and designed to fight fatigue, so you feel more energetic while on the job. 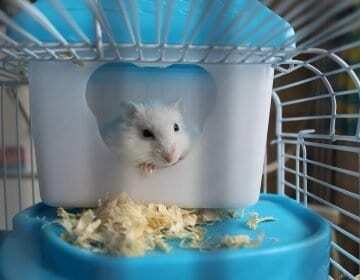 And the mesh lining is antimicrobial, which makes it capable of minimizing odors. There are some downsides to owning the Industrial Boots as well. Firstly, some customers believe they’re too narrow, even when you order the wider fit. Secondly, we’ve found that the outsoles, although made from quality rubber, are quick to wear out. Also, they don’t come with any reinforced parts, making them less suitable for more dangerous occupations. 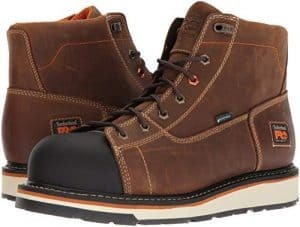 If you’re on the lookout for sturdy, waterproof work boots, you should know that Bogs is among the best brands out there. Although it’s one of the few rubber models on this list, their Rain Boots are getting praise from working men from all over the world. Let’s see what they have to offer. 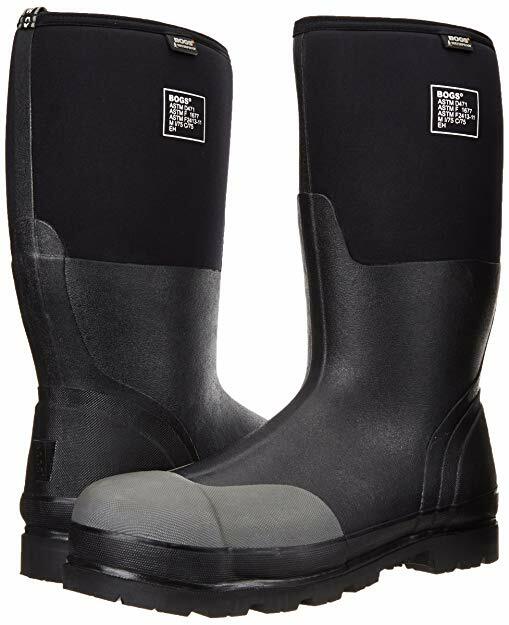 Made from top-quality neoprene rubber, these boots make sure your feet never get in contact with water, no matter where your work takes you. Their rubber outsoles boast a design that reduces the danger of losing your footing to a minimum, so you don’t have to worry about potential accidents. Since they have steel toe reinforcements, you can be sure your feet won’t get hurt even if something heavy falls down on them. The upper part of these boots is made from stretchable textile, while on the back you’ll find a pull tab. Thanks to all this, you’ll be able to easily pull them on and kick them off wherever you find yourself. We’ve found that the stretchable bootie also adds to your comfort, since it allows the material to adjust to the shape of your foot. Also, the AEGIS antimicrobial lining is pretty good at fighting off unwanted odors. These are top-notch work boots, but they’re not perfect. There seems to be an issue with the sizing chart, since there were complaints about this model being too small or too big. Also, we’ve found that the boots aren’t warm enough to fight off cold during harsher winters, so keep that in mind when making your final decisions. When it comes to footwear, Skechers is a well-known brand. All of their most popular products are sporty and comfortable, but they also make work shoes. 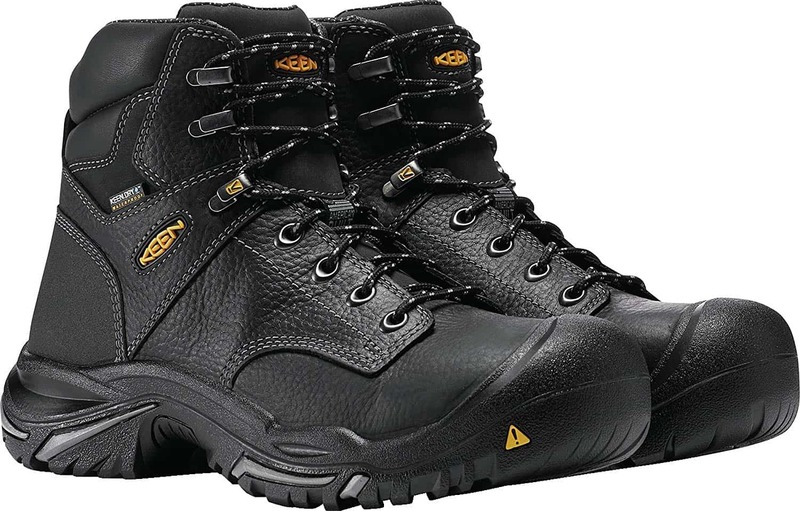 These Men’s Verdict Boots are among the most highly rated products for working men. Waterproof, sturdy and warm, they make for an excellent choice for those who have to deal with bad weather conditions. The uppers of these shoes are made from high-quality leather, which makes them completely waterproof. Add to that a very sturdy construction and you get yourself a pair of highly durable boots. Thanks to their rubber outsole, they’re of great help in preventing you from slipping while walking on smooth or wet surfaces. Since the insoles of these Men’s Verdict Boots are padded, your feet won’t get tired as much. They have a padded collar as well, which adds to the comfort, but also keeps your feet warm during the colder months. If comfort is at the top of your list, you might want to keep looking, since many customers report these boots get uncomfortable after a couple of hours on the job. They also don’t have reinforcements, which makes them a less than ideal option for construction workers and people who are in danger of hurting their feet while working. It’s a real shame since they do an excellent job of keeping water away from your feet. And lastly, we’ve found it takes some time to put them on because of the lace-up system, so you can’t really use them for quick trips to the garage and the like. If you don’t want another pair of leather work shoes, it might be worth your while to check out Muck Boots. 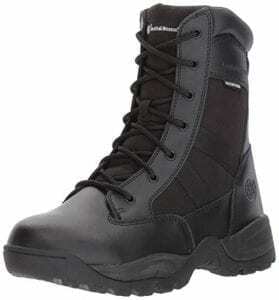 This brand offers top-quality rubber footwear with all the features necessary for a dry, comfortable day on the job. Let’s check out their Classic Work Boots to see how they fair with the rest of the models. These shoes are made using high-quality 5-milimeter neoprene rubber. Apart from making them waterproof, this also helps them retain heat and adjust to the shape of your foot, improving both insulation and comfort. 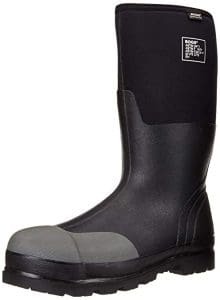 Rubber outsoles keep you from slipping on wet surfaces, which is very important when working in bad weather conditions. What about safety? Unlike many of the other models, these boots come with both toe and heel reinforcements. While the toe parts are reinforced with three layers, the heels have their own four. As a result, you’ll find it very hard to injure your feet while wearing these work shoes. 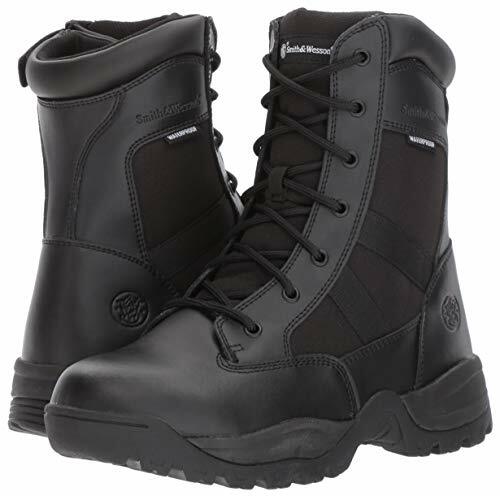 The interior of these boots features steel shanks, which make sure your arches are properly supported. This might not seem all that important at first glance, but it has a big impact on comfort as well. There’s also the mesh lining that does a good job of keeping your feet dry and your shoes odor-free. Of course, these boots aren’t perfect. The biggest downside that we’ve managed to find is the fact that they’re not all that durable – some say they’ve only lasted them a year. Apart from that, they’re also not suitable for those with wider feet, at least according to reviews. When it comes to footwear, Smith & Wesson are known for their excellent attention to detail. This results in high-quality products capable of resisting both water and damage. Their Breach 2.0 Boots are among their finest shoes, boasting lightweight design, waterproof materials and sturdy reinforcements. Made from leather and nylon, the uppers of these shoes are at the same time highly durable and incredibly lightweight. Thanks to Smith & Wesson’s HydroGuard® technology, they are very successful at keeping your feet dry at all times. They feature a steel shank that gives enough support even to those working in the toughest environments. Equipped with rubber outsoles with an innovative pattern, these work boots will keep you from losing your footing even on slippery surfaces. These work boots feature EVA midsoles, which do a great job when it comes to providing arch support and keeping you comfortable. As a result, they’re a great choice for those who need to be on their feet all day. To make it even better, they have a gusseted tongue, the purpose of which is to keep out dirt and debris, so you can care for your shoes with greater ease. Even the best of shoes have their downsides. While doing our research, we’ve found that they don’t do a very good job at keeping out the cold. A number of customers have said that they aren’t as breathable as they would like them to be. Also, they feature a side zip and no kick rim, which can make them a bit more difficult to take off. Carhartt is yet another brand that specializes in making quality work boots for men. This particular model is highly versatile, provides great arch support and boasts completely waterproof materials. Let’s check out its pros and cons. The material used for making the uppers of these shoes is high-quality leather, which adds to their durability. Their waterproof membrane ensures they never let water in, keeping your feet dry at all times. But apart from this, they’re resistant to oil and chemicals, which makes them ideal for a wide range of tasks. Thanks to well-designed rubber outsoles, they also help you avoid accidents on slippery terrains. Equipped with Ortholite insoles with five different layers of padding, these work boots make sure you get enough support for your arches. The toe part is reinforced with composite materials, which give protection without adding a lot of weight. As a result, you’ll be safe from foot injuries as long as you wear them. And last but not least, since they’re manufactured using cement construction, these shoes are sturdy, but not as flexible as some other models. Are there any other downsides to wearing these shoes? First of all, we’ve found they’re a bit too heavy when you wear them all day long. 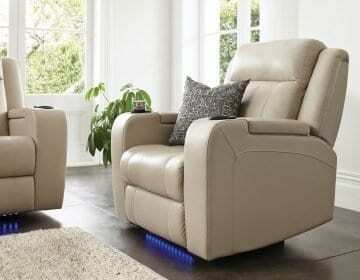 This automatically makes them less comfortable, which could be a big disadvantage for some. They can also get a bit hot after a while, which doesn’t make them suitable for those working in warmer conditions. Work boots get the worst treatment of all footwear. That’s why it’s important to maintain them properly if you want them to last a long time. Unfortunately, many people do this poorly or don’t do it at all. For this reason, we’ve thought it a good idea to explain what proper care of this type of footwear really entails. How Should You Clean Your Work Boots? If you own a pair of rubber boots, you’re in luck. Maintaining these is a piece of cake, as the material used to make the uppers is usually also rubber. When it gets dirty, you only need to wipe it down with a clean, wet cloth. Or hose them down for a more thorough cleaning. According to RMRS, it’s not the same if your work boots are made from leather. Leather needs to be carefully cleaned, as well as conditioned. You can also take some time to polish it if you want your shoes to look brand new. 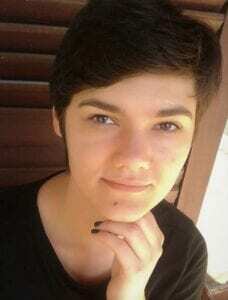 But let’s take it one step at a time. Step one. Remove the shoelaces and wash them separately using a solution of liquid soap and warm water. If they’re looking worn out, it might be better to simply replace them. Step two. Use a brush to remove any loose dirt. You don’t need to scrub vigorously, since your goal here is to make the next steps easier for yourself. And if you want to make maintaining your boots a breeze, do this every time you come back from work. Step three. Use saddle soap for the actual cleaning. Take a damp cloth and rub it over the soap, creating a light lather. Then use the cloth to wipe down your boots thoroughly. Use as much soap as necessary to remove all the dirt. Once you’ve done that, leave the boots to air dry for around 10 minutes. Step four. Now’s the time to give the leather all the nourishment it needs. This is important because leather that’s left to dry gets cracks and starts fading pretty soon. To prevent that, you only need to get a small brush, a couple of dry cloths and some leather balm or conditioner. Start the process by giving the entire uppers a rub down with one of the cloths. Step five. Use the other cloth to apply a thin layer of conditioner or balm onto the leather. Make your motions circular, but try not to push down too hard. 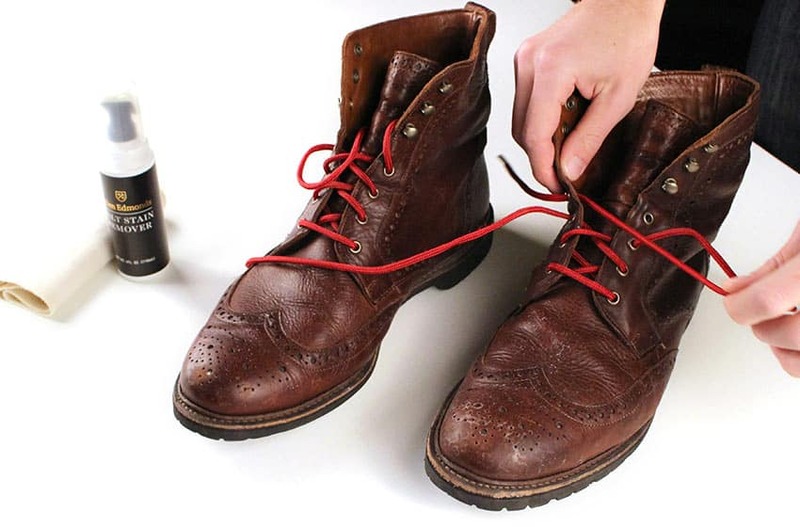 Keep applying the product until your boots don’t look old and worn out anymore. If you don’t want to take any chances, use the brush to treat a small area before you do the entire uppers, just to make sure that the product doesn’t do any damage to the leather. Step six. If you want your boots to shine despite the fact they’re no dress shoes, you’ll only need a clean cloth, a brush and the right kind of polish – wax-based polish is among the best. Wrap the cloth around index and middle fingers, dip them into the polish and start rubbing it into the leather. Once you’ve covered the entire uppers, do some quick buffing to make the boots really shine. How often should you do all that? Well, cleaning them once a week is more than enough to prevent dirt buildup. Conditioning should be done from once a month to once every three months, depending on how hot the climate is where you live. The hotter the climate, the more often you should be conditioning. When it comes to polishing, that’s always optional and therefore completely up to you. 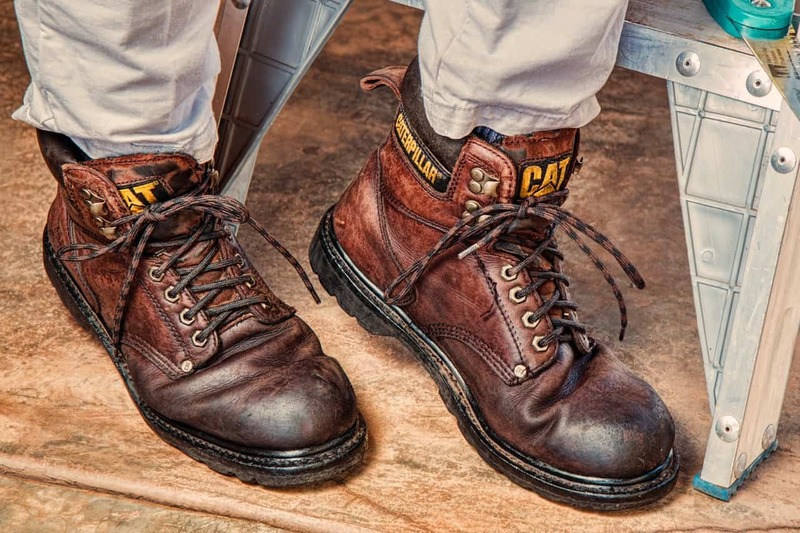 When Should You Replace Your Work Boots With A New Pair? As footwear that should keep you protected and often comes with reinforced parts, your work boots shouldn’t be used if they’re not in good shape. That’s why you should keep in mind everything that happens at work and inspect them regularly. That’s the only way to ensure your own safety in the face of falling objects, electrical mishaps and other potential dangers. There is a set of relatively clear rules on when you should throw out your current pair. According to EHS Today, if your boots have steel reinforcement parts, these are no longer good whenever they get dents in them. Notice any of the inner parts of your shoes are showing? This includes protective parts including the shank and the midsole. Whenever something like that catches your eye, the best thing to do is simply replace your work boots with a new pair. If there’s any visible damage to the toe area of your work boots, you should also consider retiring them. This is due to the fact that the front part of your shoe plays an important role in protecting your feet from injuries. Work boots made from rubber or similar materials should be regularly inspected. This is especially important if you want them to remain waterproof. Check for any separation in spots where different parts of the shoe are connected. 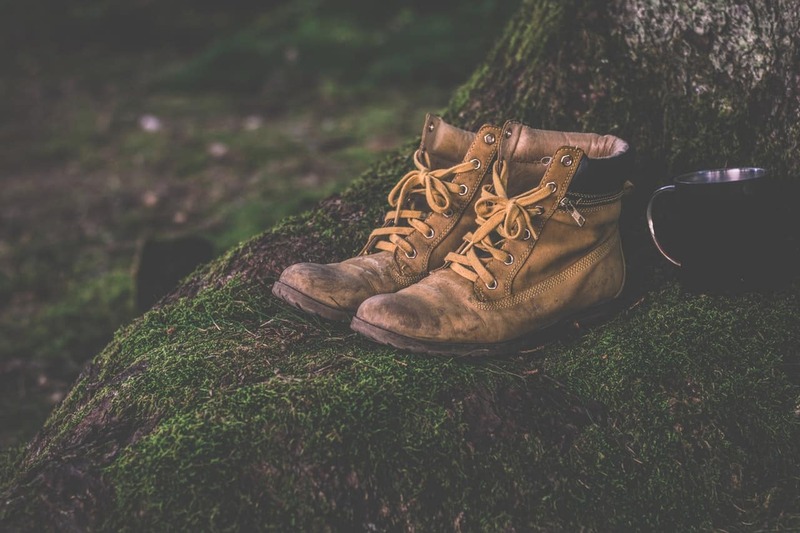 If you find any, replace your current pair with a new one, as chances are your work boots are no longer capable of keeping water out. Now that we’ve gone over all the more important rules, remember they’re not exhaustive. When deciding if you should toss out your work boots, take into account the conditions in which you work. Some of the key factors include weather conditions, hazards characteristic of your job and the amount of time you spend wearing them. The most important rule of them all is to make sure you replace your work boots whenever you’re in doubt about their safety. It’s not that easy to find your ideal footwear, at least not when it’s all up to you. But we can say with confidence that all our hard work in finding the best waterproof work boots has paid off. Now we have 10 different models to offer to you for consideration, and we believe they’re all worthy of it. We’ve found that their full grain leather with an oiled finish is the very best at keeping water away from your feet, which is the main factor when you’re shopping for waterproof footwear. Their padded collars and perforated EVA footbeds make them extremely comfortable to wear, even when you have to be on your feet all day long. In addition, they have non-slip outsoles, boast a high level of durability, and are very easy to put on and kick off. What more could you want from your work boots? That’s exactly what we were thinking while trying out this model from Timberland. But there’s always a chance you don’t quite agree with us, which might be the perfect opportunity to help us in our quest for the ultimate work boots. If you think you know of a model that would outshine our contestants, we’d surely love to hear about it! Do rubber work boots stretch after they’ve been worn? No, they don’t. If you’re worried about the boots not fitting after you’ve worn them for a while, there’s no need. Some materials are prone to constricting and expanding due to sudden and significant changes in temperature, but that’s only temporary. If you’re worried about your rubber boots not being flexible enough, look for models with stretchable booties that are capable of adjusting to the shape of your feet. 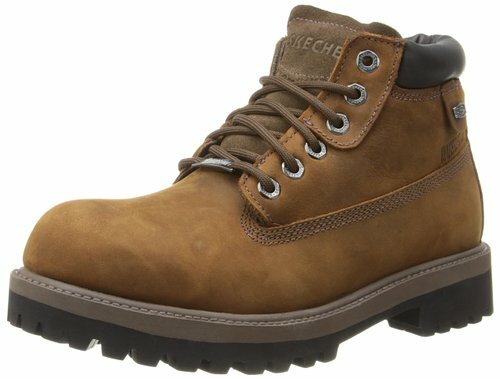 How do I find the right boots for working on concrete all day long? When browsing through our detailed reviews, pay attention to shanks, midsoles and special technologies for reducing fatigue. Not all work boots have steel shanks, but when they do, it’s often a sign that they provide improved arch support. Quality midsoles are also important, especially if they provide both arch support and padding. But what’s most important are shock absorption and technologies such as Anti-Fatigue, the purpose of which is to minimize the strain that’s being put on your feet when you have to walk on concrete all day long. How will the boots hold up against chemicals? There’s no simple answer to this question, as work boots are made from different materials, and using different methods and technologies. Most of them will keep your feet protected from water, but would probably get damaged if you’d let them come into contact with chemicals. Luckily, there are some models that are made with this purpose in mind and are resistant to oil and many other harsher substances. When looking for your ideal pair of work boots, keep this in mind and look for those with tougher finishes. Which size should I order if I have a wide foot? Those with wider feet should be extra careful when ordering their new work boots. We’ve found that many models have problematic sizing when it comes to this particular group of people. If you want to avoid getting shoes that just don’t fit, make sure to check in our detailed reviews if the model of your choice is among the problematic ones. If it is, we suggest you browse through some of the product’s reviews to see if you should order a size bigger. Since we know how important it is not to lose your footing while on the job, we’ve made sure that all the reviewed models come with non-slip outsoles. Of course, some are better than others, but they all provide a solid amount of traction. If you want your shoes to be extra good at keeping you from falling, look for those with special technologies for improving grip.